The first large-scale assaults began on January 9, 1948, when approximately 1,000 Arabs attacked Jewish communities in northern Palestine. By February, the British said so many Arabs had infiltrated they lacked the forces to run them back.5 In fact, the British turned over bases and arms to Arab irregulars and the Arab Legion. In the first phase of the war, lasting from November 29, 1947 until April 1, 1948, the Palestinian Arabs took the offensive, with help from volunteers from neighboring countries. The Jews suffered severe casualties and passage along most of their major roadways was disrupted. On May 4, 1948, the Arab Legion attacked Kfar Etzion. The defenders drove them back, but the Legion returned a week later. After two days, the ill-equipped and outnumbered settlers were overwhelmed. Many defenders were massacred after they had surrendered.7 This was prior to the invasion by the regular Arab armies that followed Israel's declaration of independence. Despite the disadvantages in numbers, organization and weapons, the Jews began to take the initiative in the weeks from April 1 until the declaration of independence on May 14. The Haganah captured several major towns including Tiberias and Haifa, and temporarily opened the road to Jerusalem. During the summer of 1948, Count Folke Bernadotte was sent by the UN to Palestine to mediate a truce and try to negotiate a settlement. 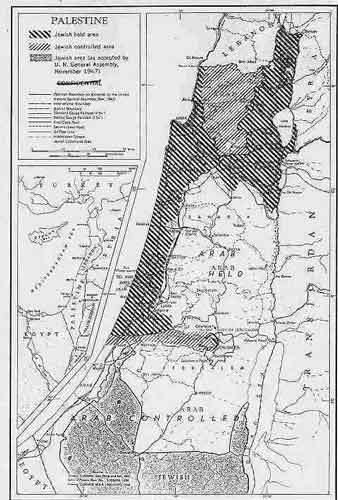 Bernadotte's plan called for the Jewish State to relinquish the Negev and Jerusalem to Transjordan and to receive the western Galilee. This was similar to the boundaries that had been proposed prior to the partition vote, and had been rejected by all sides. Now, the proposal was being offered after the Arabs had gone to war to prevent partition and a Jewish state had been declared. The Jews and Arabs both rejected the plan. The failure of the Bernadotte scheme came as the Jews began to have greater success in repelling the invading Arab forces and expanding control over territory outside the partition boundaries. The United States, the Soviet Union and most other states recognized Israel soon after it declared independence on May 14, 1948, and immediately indicted the Arabs for their aggression. The United States urged a resolution charging the Arabs with breach of the peace. On July 15, the Security Council threatened to cite the Arab governments for aggression under the UN Charter. By this time, the Israel Defense Forces (IDF) had succeeded in stopping the Arab offensive and the initial phase of the fighting ended.